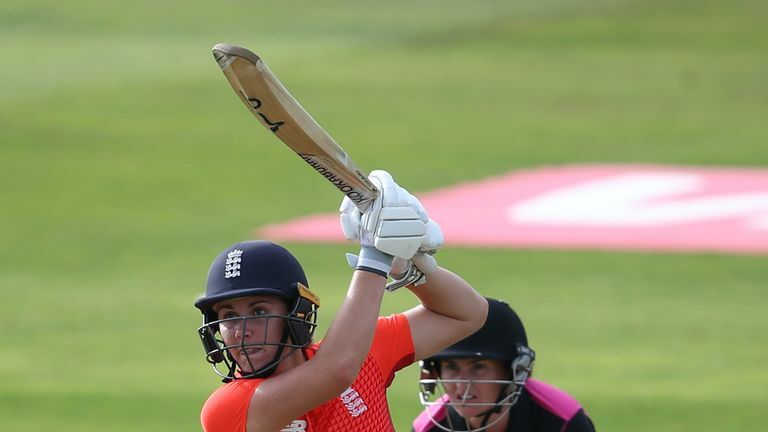 The opener has recently begun a fruitful partnership at the top of the order with captain Suzie Bates and the pair remain one of the most explosive top two in women's cricket. Devine acknowledges that despite the White Ferns being blessed with talent throughout their team, they have yet to achieve their potential - with a world title still missing from this team's trophy cabinet. "It's not something that floats around in my head too much," she said. "Probably the biggest disappointment for me was the 50-over World Cup last year. "I thought that was a fantastic opportunity for us to win the title, but I am living the dream being able to travel the world and play the sport I love." New Zealand went into last year's World Cup as one of the strongest sides - with a team that also included the White Ferns' third-highest one-day runscorer, Amy Satterthwaite, the powerful Rachel Priest and spinner Leigh Kasperek. "It's about keeping things simple," she clarifies. "Top of off stump is a good ball to anyone in the world - if you hit that area consistently, you can build pressure that way. "You can get carried away in sport and complicate things more than you need to with plans, this and that with your field and variations. "At the end of the day hitting a hard length top of off is a wicket-taking ball and with the bat, it's 'see ball, hit ball'. That's what we took away from the T20s in England." Devine has gone through many changes over the course of the last decade, not least where she has batted for New Zealand - having been used as a bowling-allrounder for most of her career and primarily batting in the middle order. And, with the continued growth of women's cricket and the rise of T20 franchise cricket, Devine knows she has to keep developing as a player to keep up with the younger stars coming through. "Everyone's game has had to evolve," the Loughborough Lightning player said. "If you don't you are going to be stuck behind and missing out. "I want to keep up, be innovative and lead from the front. I have only recently opened the batting, so it's been a massive learning curve and a huge mental shift. "Sometimes it's about dragging that ego back. I know the longer I am in the more damage I can cause. My power game is where I feel I can take a side apart." One player in particular that Devine sees a bright future for is allrounder Amelia Kerr, who in June 2017 became the White Ferns' youngest representative in a World Cup. A talented football and cricket player, Kerr confessed she picked playing the latter for her country after watching Devine batting during the 2010 World Cup final - which New Zealand went on to lose to Australia. Despite still being a teenager, the leg-spinner has already broken numerous records - including smashing the highest individual score in women's ODI with a breathtaking 232 against Ireland in June 2018. Devine believes Kerr is destined to be one of her country's finest players but is realistic about the expectations placed on her at this stage of her career. "Amelia is a great kid and we have a special relationship from growing up in the same town in Wellington," Devine said. "There has been a lot spoken about Amelia, not just in the last couple of months, about the talent she has. She has a lot to learn and the exciting thing for me is that she only 18. "For me it's about helping her as much as I can. She is going to be a hell of a lot better than me, that's for sure! "Her batting has been in the limelight but the control she has with her leg-spin is something I haven't seen in a long, long time." The growth of women's cricket remains an important part of playing the sport for Devine, who recognises that for all the steps forward the game has taken there are many more to go. The development of tournaments like the Kia Super League (KSL) and Women's Big Bash League (WBBL) are pivotal to improving domestic standards. "I don't think I have ever really cared about: 'You play for England, I play for New Zealand so I'm not going to tell you my secrets'," she explained. "If I tell one of the young county girls how I bowl my slower ball and likewise I can learn something off them, it's going to be for the greater good of the game. "I hope we keep sharing knowledge and making each other better. It's important the standard continues to grow, and we put in performances that attract new people to the game. "People want to watch exciting, innovative cricket and hopefully we can do that at the World T20. If the standard is great, people won't want to miss out."